but one wrong step ends life! ''Aper'' is an Austrian word for a mountain, grass or field, where the snow is melted. The ''Aperer Tower'' is such a steep height. Snow can't hold there long: therefore the name. The way to the top from the back side of the mountain is quite comfortable, but step for step you need all awareness. The rocks can move, so you can hurt your feet badly. Walking alone you have to be even more aware, because you have to help yourself. Clouds pile up over the heights and threaten to rain. Dangerous are thunderstorms in the height. The way is immediately slippery. Flash in this unprotected region without trees can kill. Thursday night I find nearly a plane place for ''Seacow''. First nights in the height of 1740 Metres is hard to sleep. After midnight I pay my parking place at an automatic counter for 24 hours: four Euros. With this fee I stay two nights. The Austrians threaten the ones, who don't pay with a 'possession disturbance process'. This word is not known in Germany. Short breakfast at 5.00 a.m.: Then I start in the day around 6.00 a.m. One way distance is around eight, nine Kilometres. Only huge rocks give me a rest in the shawod. 1,5 Litre water is most important, but bread and cheese is necessary too. 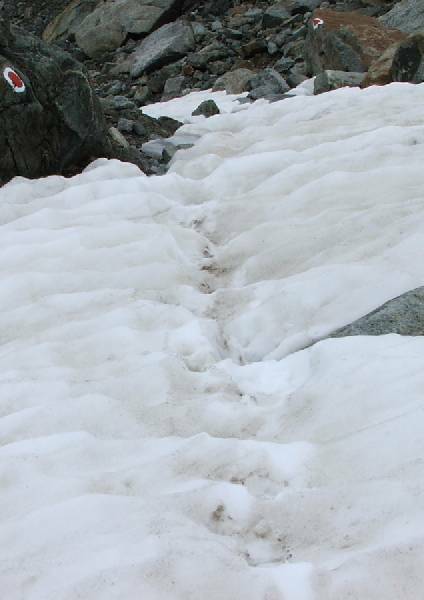 One snow field I have to cross, where snow comes in my shoes. But with dry feet I can continue to climb the 'Aperer Tower'. Next to this mountains are glaciers. The glaciers are accessible only in groups. A robe has to connect everyone in the group, because there can be dangerous crevasse, covered with thin snow only. Grey ice waters melt from the glaciers. On my way back from the height I have a short bath in this ice cold flood. I protect my skin with sun cream two times, but the sun and the arduous effort are hard to stay without pain. My feet are tired, all the body is tired - and most dangerous is a sun stroke for my head. Late in the afternoon this headache begins. Around one hour, before I reach the car, I fall asleep in the shadow of some trees. Then finally I am 'at home' in the Seacow, the simple motor home. Half hour rest helps, before I cook noodle and peppermint tea. Eating my simple meal heavy rain starts. Immediately the temperature falls five, six degrees. In the evening it is 10 degrees Celsius outside, at night only six degrees. I stay one more night. At 4.00 a.m. my night is over. Slowly I start in a new day, heat up the gas oven. In my head the blood still hammers, but the pain is gone. From the windows I watch cows with their bells around the neck. They don't move, so their bells are silent. The height, where I marched 12 hours ago are decorated with snow. Again at 6.00 a.m. when the first sun rays kiss the trees above the parking place, I drive back into the valley to the little village Neustift. My body is exhausted, 'burned out'. Slowly, very slowly I move a few steps here, sit in the beautiful Neustift church for a while, buy some food and relax. In this mood most people look happy. People in Tyrol are friendly. Tourists from all countries admire this beautiful mountain region. The street through Stubai Valley ends in 'Mutterbergalm' (1721, 'Mother Mountain Alpe'). From there cable trains bring summer ski sportsmen up on the Glaciers. This mechanical entertainment for thousands is not my taste. This mechanical entertainment for thousands is not my taste. The stroke from the glacier provides water for a little muddy lake. There I enjoy my evening bath. Then again I take the road up to Oberiss, the romantic mountain street. I sleep on plane ground; only 100 Metre above threatens rocks. My short wave radio only brings Radio China in a German. Some artist tells his story, how he learned dance performance on one leg only after an accident. Time to sleep. The Sunday promises nothing but sun. After two pot coffee my heart is beating enough, to move upwards. Like on Friday the Seacow parks at the Oberiss Hut. At 7.00 a.m. my feet start walking. Soon I'm 400 Metres higher at the Franz Sepp Hut, from where a sign says: ''2,5 hours to Rinnen Top''. I count double time. 80 Metres under the height cross the way is dangerous. A group of people puts on safety belts like trousers and around the shoulders too. So they go upwards on a steel cords always connected. There is a group leader with them, and they all use helmets for this arduous steep way next to the abyss. I don't have this equipment. I rest in the shadow, eat my last food. I'm in sad mood, to give up five minutes before the height! 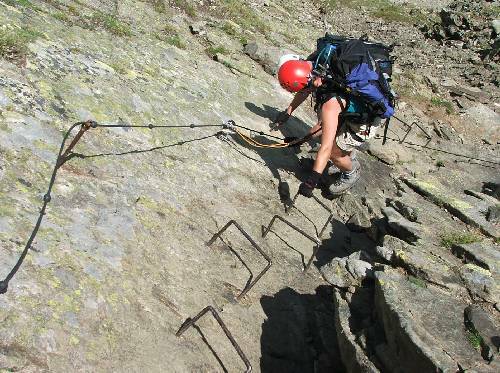 A Tyrolean mother with her young daughter laugh: both climb up like cats without any safety equipment. This young woman fires up my ambition. With trembling knees and hands I just follow. I keep my eyes closed on the stones and the steal hook in the rocks, to support feet and hands. Finally I have done it: 3000 Metres! After one hour rest I return with the group people with growing safety. Slowly step by step I return after 10 hours without any harm. This report at the parking place Oberiss Hut finishes this marvellous week end. With delicious food and an evening coffee I feel happy, to return home to my beloved Mimamai, the anchor of my heart. Before I come home, I have a fresh bath in the Bavarian Walchensee. Finally I have done it: 3000 Metres!